"Having been at Gen Re for over a year now, I find that the knowledge I have gained through in-branch training and CPCU testing has grown exponentially in a short amount of time. We are constantly being challenged to learn more and do more to broaden our industry knowledge. Jump school is the perfect example of a program that allowed us to tap into a number of different aspects of the industry in a way we would never be able to in a typical classroom. It allowed us to pick the minds of various industry experts within the Gen Re community who were more than willing to help. With a culture like this, I know choosing to work for Gen Re was the right decision and I am eager to see how much more I will grow here. " 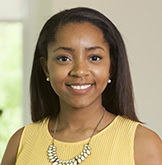 "After interning at Gen Re, I felt it was obvious that this is where I wanted to start my career. Everything from the work I do to the people I work with has been better than I ever expected. 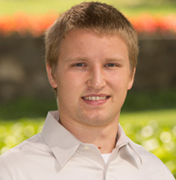 I am an actuarial student and mainly focus on Long Term Care, but in my short time at Gen Re I have also already gotten experience with many different products, including Life and Medical Supplement insurance. Each day is filled with learning, and I look forward to what my future at Gen Re has in store." 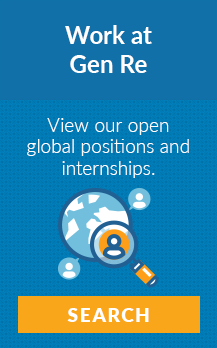 Whether you major in risk management, actuarial science, business or another field of study, you can apply for any entry level position at Gen Re. A university degree, good grades, relevant internships, foreign languages and/or work experience can open the door to a position at Gen Re. Gen Re provides Underwriter Trainees with a high level of authority and productivity early in their career. They begin with Jump School, where they are exposed to all aspects of the reinsurance and insurance business while building an international network of fellow Trainees. Our Actuarial Trainees also enjoy training programs along with company support within the Actuarial Exam program. Training continues throughout your career at Gen Re. Check out our Open Positions for available Entry-level and Trainee opportunities.